A newly published study shows that landslides triggered by seismic vibrations will be a major hazard of large earthquakes. The study offers better ways to model and forecast these landslides, offering foresight to the people who plan emergency quake response. Earthquakes cause several distinct varieties of damage. Some of these are fairly well understood in theory, and experts can make useful scenarios for them. These include the "big four" of shaking damage to buildings, tsunamis, ground liquefaction, and fault motion. We can counter their respective threats by computer-tested structure designs, tsunami modeling and warnings, liquefaction hazard maps, and regulations keeping structures away from active faults. Landslides are kind of a wild card, though. The typical urban landslide occurs when gravity overrules the strength of a hillslope, because heavy rainfall lubricates it or human activities disturb it (usually both at once). Common landslides can be fairly well assessed by geotechnical professionals, and geological agencies have been preparing maps of this general hazard for many years. Earthquake landsliding is a different animal that typical methods can't predict, and they can have devastating effects. For instance, the 2008 Wenchuan earthquake in China caused an estimated 60,000 landslides, which were responsible for tens of thousands of deaths. Few studies have made systematic surveys of landslides after earthquakes, so we don't have good databases to work from—and those are only trustworthy for the specific geologic setting of their locations. The new study in the Bulletin of the Seismological Society of America, led by the University of Washington's Kate Allstadt, tests a new method of simulating earthquake motions and the resulting landslides. Alstadt picked the Seattle region: it's well mapped by geologists, intensively studied by seismologists, and widely prone to landslides given its rainy climate and mix of subsurface materials. Moreover, the city is cut by the Seattle Fault, which last ruptured around the year 900 and is capable of a magnitude-7 earthquake at shallow depths. Allstadt's team took detailed maps of the city's rocks and topography and calculated the generic landslide risk of every 5-meter square. Then they subjected the resulting model to the most realistic synthetic magnitude-7 Seattle Fault earthquake they could devise. In effect, they built a quake generator capable of turning out a wide range of plausible earthquakes and a fine-scaled sim-Seattle to unleash them on. This kind of study pushes the limits of today's computers, and the details of Allstadt's method—the tradeoffs she made and the simplifications she chose—will be of lasting interest to specialists. Allstadt's team tested two levels of soil saturation: the unusually dry conditions during the magnitude 6.8 Nisqually earthquake of 2001 and a totally wet scenario. This made a huge difference in their results. In the dry scenario, their synthetic magnitude-7 earthquake caused almost 5000 landslides that endangered about 1000 buildings—and the runout zones, where the landslides went, endangered twice as many more. For the wet scenario, 30,000 landslides put more than 16,000 buildings in peril. Here's a sample of the resulting map, with downtown Seattle in the center. A blowup of the downtown area shows the hazard to the interstate. The simulation documented threats to hundreds of kilometers of roads, pipelines and other infrastructure, especially in the runout areas. Interstate 5 runs past downtown Seattle. Its westernmost point is where the remarkable Freeway Park straddles the road. 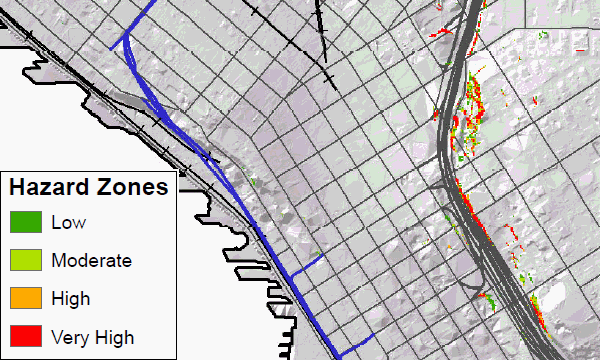 This scenario shows how landslides may add their own hazard to the shaking damages here. 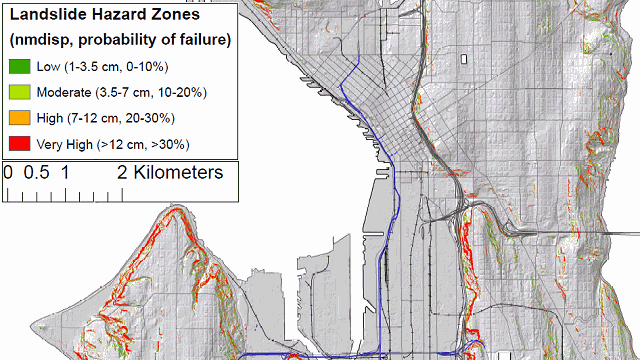 One-third of these landslides were outside areas that the city considered slide-prone. That's a vivid testimony to what we have been overlooking for all this time: earthquake landslides are not the same thing as regular landslides. 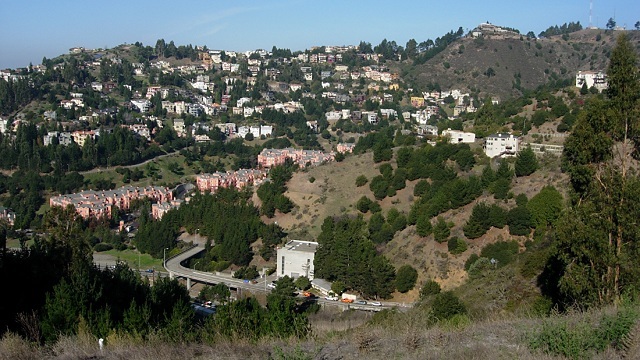 Allstadt's methodology could be successfully applied to the Bay Area—I won't say "easily," because the prep work is immense and the computing resources are demanding, but the conceptual problem is just the same: heavily inhabited hillslopes, large earthquakes, well-mapped geology, lots of smart people and great coffee. A whole family of scenario earthquakes could be run to forecast likely landslide areas from an event of a given magnitude. Allstadt even suggests that landslide simulations could be run automatically after a major earthquake, using the fresh data not just to forecast the likely damage, but to nowcast it.